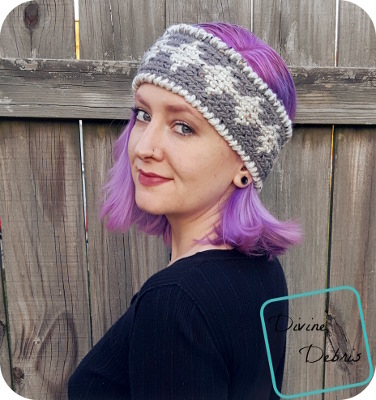 You can also purchase an ad-free pdf in my Ravlery shop for this pattern. It helps me keep making patterns week after week. 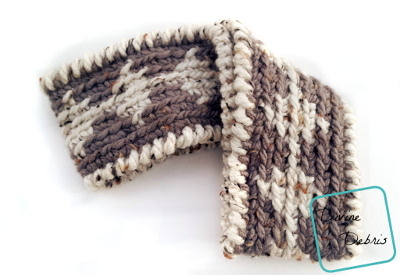 This earwarmer is worked in the round, with a slip st at the end of the row into the first stitch of that same row, in 2 sections – the main body and then the edging (on both edges). Following the first row, sc into the back loop only. At the end of the row, slip st into both loops of your 1st st, this will help to keep your seam straight. Every stitch in the main body of this pattern is a single crochet. The directions for the graphing rows will only tell you what color (ie: Color A, Color B, etc…) and the number in the parentheses tells you how many scs to make. Color A is the gray and color B is the cream. 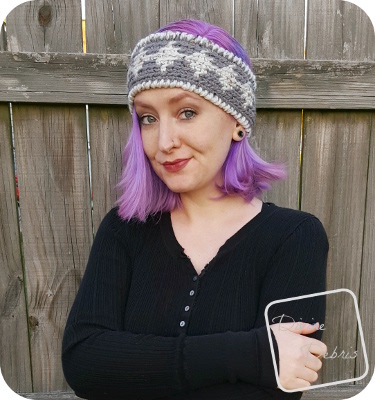 I used Loops and Threads Charisma Tweed for this headband for size 22″, color A in gray measured 1 oz/ 31 yds and color B in off white measured .7 oz/ 19 yds. You can replace the first row with a foundation single crochet row if you would prefer. The following rows are worked into the back loop only. Fasten off color A, weave in your ends. Note: you can go down to a J (6.00 mm) hook here, if you want a bit snugger fit around the band. That’s a preference thing (what I did) but you don’t have to if you don’t want to.